The areas signify territory where ceramics of the Shang "metropolitan" traditions were found: Red for Erlitou, yellow for Erligang, and violet for the Anyang period. Note: The ares do not necessarily mean political control. Small names in brackets are the places traditionally believed to have been "capitals" of the Shang. Foreign tribes in italics. Click to enlarge. Map according to Campbell 2014: 20, 70, 108, 130, Liu and Chen 2003: 76, 88, 107, and Tan 1982: 13-14. The kingdom of the kings of the Shang dynasty 商 (17th-11th cent. BCE) had its core area in the middle course of the Yellow River, in the modern province of Henan and the western part of Shandong. The royal seats were often transferred to safer or more auspicous places. Traditional histories like Shij 史記 enumerate the capitals Bo 亳 (modern Caoxian 曹縣, Shandong), Ao 隞 or 囂 (Xingyang 滎陽, Henan), Xiang 相 (Neihuang 內黃, Henan), Geng 邢 or 耿 (Xingtai 邢台, Hebei, or Wenxian 溫縣, Henan), Bi 庇 (Yuncheng 鄆城, Shandong), Yan 奄 (Qufu 曲阜, Shandong), Yin 殷 or Beimeng 北蒙 (Anyang 安陽, Henan), Mei 沬 (also written 妹) or Chaoge 朝歌 (Qixian 淇縣, Henan). The last known residence of the kings of Shang was Yin, for which reason the dynasty is also known under that name. Archeologists refer to the remains of this city as "ruins of Yin" (Yinxu 殷墟). The residence of the last king of the Shang was Mei close to Muye 牧野, Henan. Archaeology brought to light the walled cities in the sites of Erlitou 二里頭, Yanshi 偃師, Erligang 二里岡, and Huanbei 洹北 (and some others), and the last, unwalled residential city of the Shang, close to Anyang 安陽. "Colonies" were found in Panlongcheng 盤龍城, Hubei, and Subutun, Shandong. The Shang kings secured not only power, but also access to important resources, like salt in southern Shanxi and Anhui, or ores in Hubei and Jiangxi. While the material culture of these political centers dominated the Yellow River plain and places beyond, some locations retained their own, distinct material cultures, like Yueshi 岳石 in Shandong, Xingan 新淦 (新干) and Wucheng 吳城 in Jiangxi, and Sanxingdui 三星堆 in the Sichuan Basin. Historiographical texts as well as oracle bone inscriptions mention numerous place names that can only crudely be identified with modern places because not all of them survived the Shang period. Names of more distant communities and states that were not direcly controlled by the Shang kings were commonly given the suffix fang 方. Such were Guifang 鬼方, Tufang 土方, or Gongfang 𢀛方. It can be assumed that many of them were polities of non-Chinese peoples, like the Quanrong 犬戎, inhabitants of the western region, or the peoples of the Huai River 淮河 region like the Yifang 夷方 or Renfang 人方. 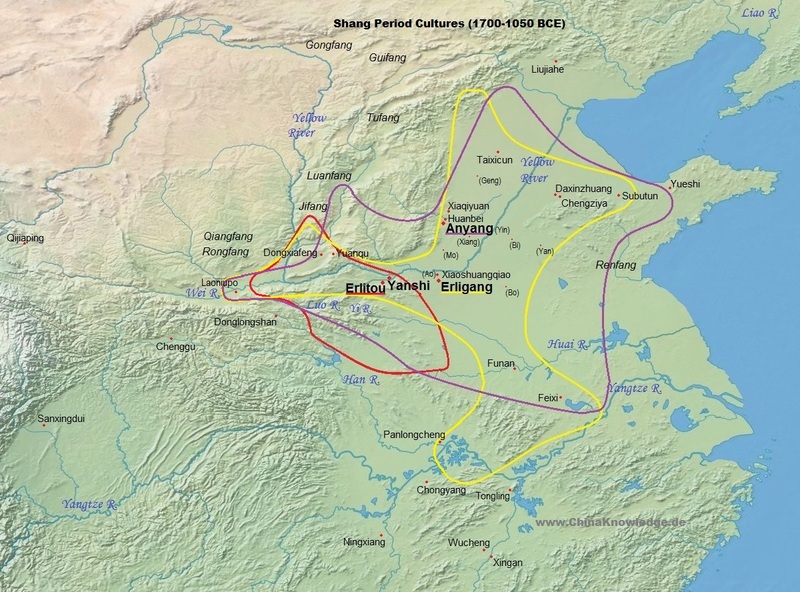 It is assumed that by the 15th century BCE the kingdom of the Shang experienced its largest expansion, with colonies even in the Yangtze River valley and beyond. The cultural achievements of the Shang, most visible in the ritual bronze vessels, were adopted by many of the surrounding peoples, but altered according to their cultural concepts. The people of the Zhou 周 (11th cent.-221 BCE) lived in the Wei River 渭河 valley, and expanded towards eastwards in the middle of the 11th century BCE, and eventually replaced the Shang dynasty. Campbell, Roderick B. (2014). Archaeology of the Chinese Bronze Age: From Erlitou to Anyang (Los Angeles: Regents of the University of California). Liu Li, Chen Xingcan (2003). State Formation in Early China (London: Duckworth). Tan Qixiang 譚其驤, ed. (1982). Zhongguo lishi ditu ji 中國歷史地圖集, Vol. 1, Yuanshi shehui, Xia, Shang, Xizhou, Chunqiu, Zhanguo shiqi 原始社會、夏、商、西周、春秋、戰國時期 (Beijing: Zhongguo ditu chubanshe).